Previously, I've discussed the simple ways you can use the Web to reach an audience and get a business idea off the ground. Now that you're in business, we're going to discuss how the Web can ease up some of the pressures that running a business has added to your daily life. With everyone spending hours daily online, surely with a few tricks and a flick of your wrist, it can boost your business. Harness the power of the Web to increase traffic to your store, expand your business beyond a local radius, and make the most of the free tools available online to replace costly marketing activities. You need an online strategy to support your business goals, and take my word for it, it's not as complicated as it sounds. 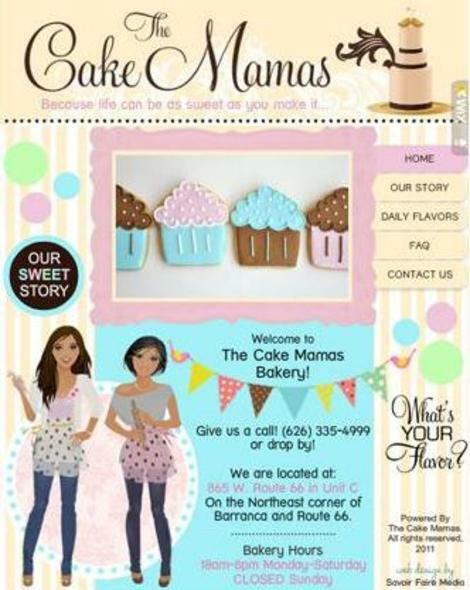 Let's start with a fabulous example: The Cake Mamas. The Cake Mamas is an LA-based bakery co-founded and run by two women, Janelle and Fabiola, who were once married to the same man. Starting from nothing, in just two years they've had unheard of success-earning a Cupcake Wars Winner title and opening two booming shops. As a result of the economic downturn, both Janelle and her husband were let go from their jobs, when the idea to launch The Cake Mamas came to Janelle. As it turns out, this was one hit recipe. The business' success was amplified through a clever online strategy. The Mamas' scrumptious website was easily built with Wix.com, providing them with a professional online presence on a shoestring budget. The Cake Mamas' story will unfold throughout my tips below, so stay tuned! With very little money, Janelle and Fabiola wouldn't be able to open in the ideal location, but The Mamas knew foot traffic wasn't necessary if people could find them online. Starting out, they couldn't afford tangible aesthetics for the store; but getting that dream storefront online was achievable and affordable. Tip: Your business' website is a storefront in itself. Invest time and thought in your website, it says a lot about your business.This doesn't need to cost an arm and a leg, utilize the free website building resources on the Web. Find a template you fancy, and customize it to give it your own flavor. www.Naijaflash247.com: Thanks for this business tips.